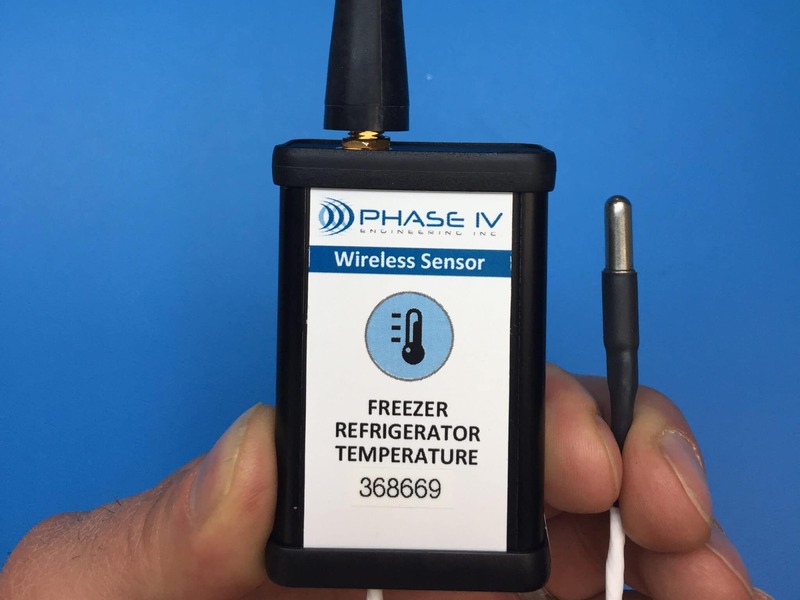 Refrigerator & Freezer Monitor - Wireless Temperature Sensor with Tethered Probe and Thermal Buffer (one sensor per refrigerator or freezer) - Phase IV Engineering Inc. Need a price or a quote? 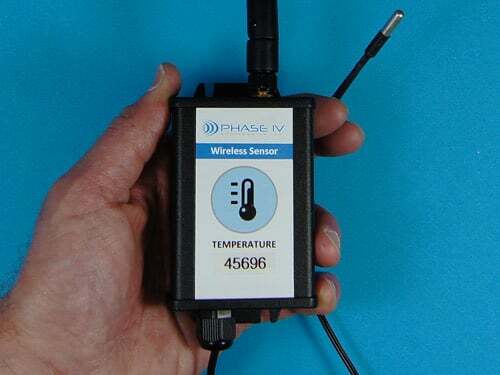 Have questions about wireless sensor technology? 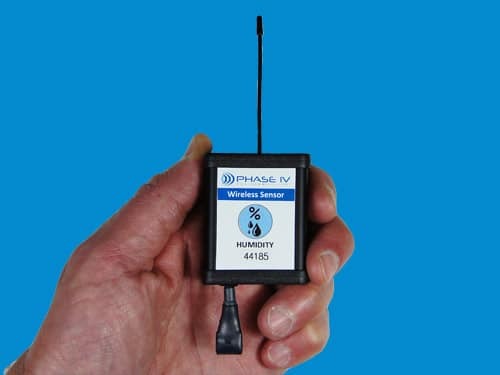 Need a specialized wireless sensor solution? Contact one of our wireless sensing experts. Designed for easy and effective monitoring of refrigerators & freezers. Install in 5 minutes – login to your SensorManager.com account with your PC, Smart Phone, or Tablet to view sensor graphs, edit sensor settings, and set email and text alerts. Sensors come with everything you need – adhesive velcro mounting strips, special cable routing stickers, a user name and password for your secure SensorManager.com account, and a complete easy-to-understand user manual. Watch a video explanation of the refrigerator and freezer wireless sensor with alarms. 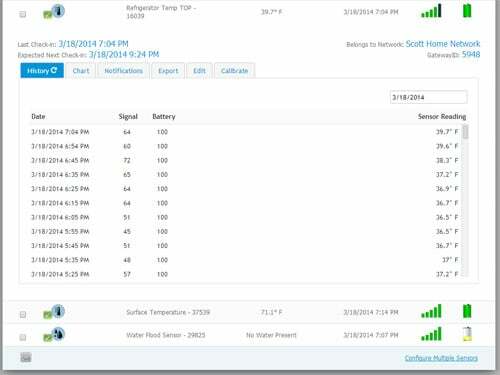 Wireless Sensor WSN SYSTEM Video Demos – watch a new system be up and running in 5 minutes. See the detailed product description below. 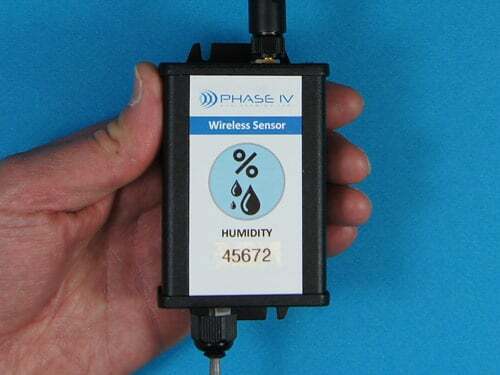 We offer over 30 different types of wireless sensors (humidity, door-open, flood, pressure…). Expand your WSN wireless sensor system to up to 100 sensors! We specialize in custom sensors. If this isn't exactly what you need, please contact us. We specialize in custom sensors. If this isn’t exactly what you need, please contact us. 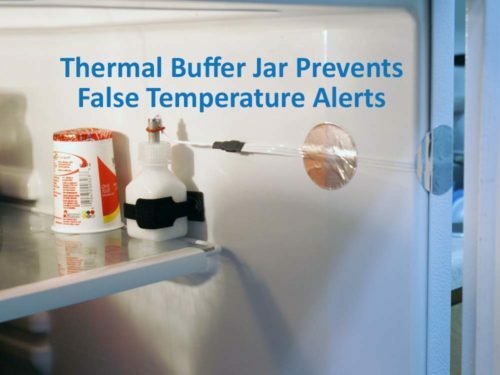 Includes “thermal buffer jar” for the temperature probe to prevent false temperature alerts when the refrigerator door is opened. Designed to CDC Vaccine storage standards. (see photo in the top right corner of this page). 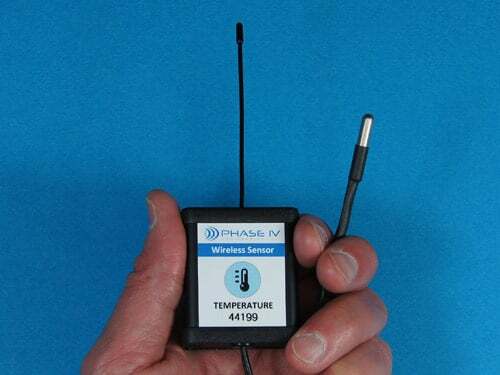 Refrigerator / Freezer Probe temperature range: -40°C to +125°C (-40° to 257°F). Probe: ~36 inch tether with refrigerator monitoring temperature probe. Radio range: Up to 300 feet in open air. Repeaters are available to extend range. 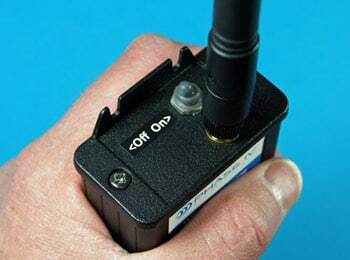 915 MHz radio (North America). Will not interfere with 2.4 GHz WiFi networks. Contact us if outside North America. 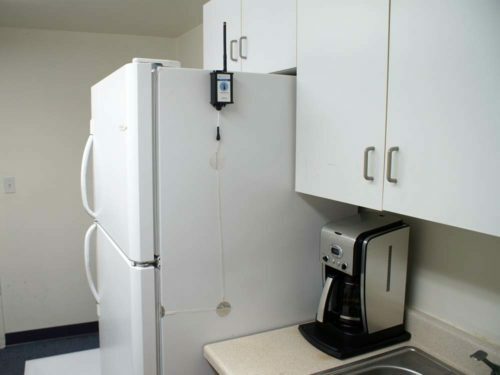 Refrigerator / Freezer Monitoring Sensor Size (in inches): 1.76 wide x 2.1 high x 1.0 deep. Wire antenna: 3.6 inches long. 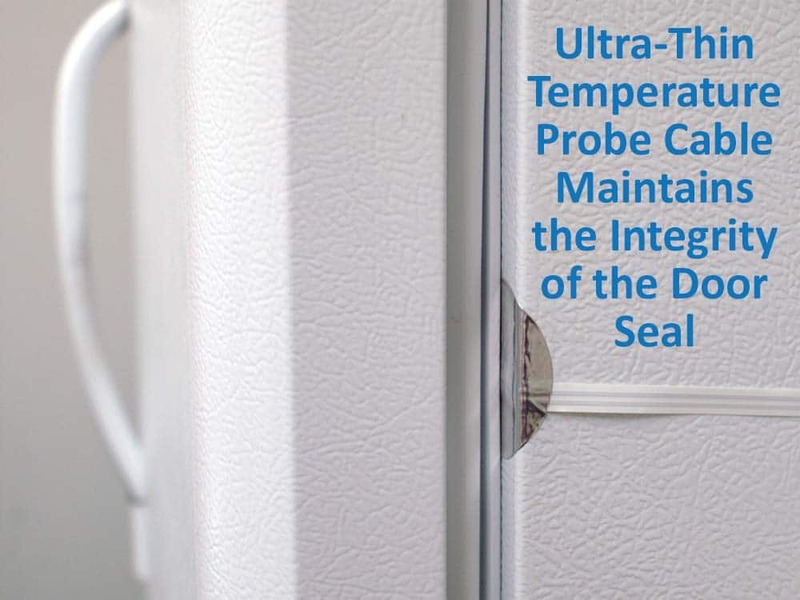 Sensor is not sealed and needs to be mounted on the outside of the refrigerator. See industrial version for an IP65- water and dust protected enclosure. Transmission intervals from 10 minutes to days. Telephone alarms are also available – contact us for more information. Data graphing with user select-able time frames. Graphs highlight data points outside alert limits. Zoom-in function. Graphs show temperature alarms. Download data to spreadsheets with just one click. See our Starter Kits to get a major discount in setting-up your first Wireless Sensor Network. Our Starter Kit product page will walk you though assembling all the parts you need to get started. 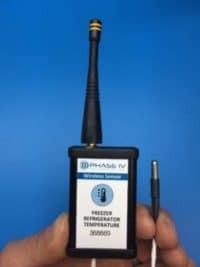 For more general information about our Wireless Sensor Network, see the Practical and Off-the-Shelf Wireless Sensor Networks information page. 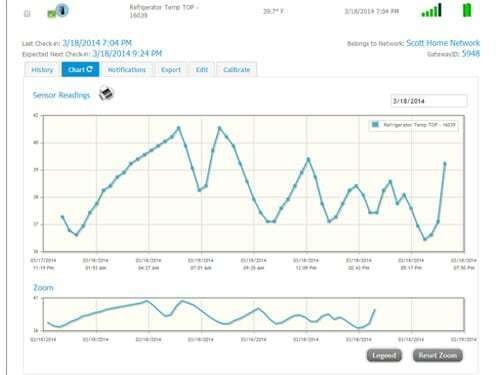 Also see the Getting Started with our Wireless Sensor Network page. *See industrial version for sealed enclosure and battery life of up to 10 years. Battery life is reduced at temperatures outside the range of +10°C to +50°C (+50°F to +122°F). This sensor is not certified or intended for food or chemicals contact.